PRADA S.p.A. is an Italian luxury fashion house, specializing in leather handbags, travel accessories, shoes, ready-to-wear, perfumes and other fashion accessories, and, according to several footages, cruelty to animals too. In September 2015, PETA investigators traveled to South Africa to get never-before-seen footage inside the largest ostrich slaughter companies in the world. There, YOUNG OSTRICHES ARE KEPT IN BARREN DIRT FEEDLOTS UNTIL THEY’RE TRUCKED TO SLAUGHTERHOUSES. THE 1-YEAR-OLD BIRDS ARE TURNED UPSIDE DOWN IN A STUNNER, THEN HAVE THEIR THROATS SLIT AND THEIR FEATHERS PLUCKED OUT, creating the bumpy-textured skin that Prada uses in its handbags and store sofas. Simon’s Supports Cruelty to Animals: Please Sign Petition. “Why would anyone want to wear clothing or accessorize a home with products containing wool or fur that has been ripped from the animals’ skin?,” asks PETA. LA MAISON SIMONS, commonly known as SIMONS, a fashion retailer in CANADA based in the province of QUEBEC, will reply that many people want to because it continues to sell clothing and home accessories made of fur and angora wool from RABBITS WHO SCREAMED IN PAIN AND TERROR AS WORKERS RIPPED THE FUR OUT OF THEIR SKIN WHILE ALIVE EVERY THREE MONTHS. After several years, the rabbits who will survive this ordeal will be hung upside down and their throats be slit. Please sign and share the petition to urge Fashion Retailer Simons to halt fur and angora sales. And don’t forget to message Simons and comment on its Facebook and Twitter pages. A PETA EXPOSÉ REVEALS SUFFERING ANIMALS WAREHOUSED IN FILTHY CONDITIONS AT REPTILES BY MACK, an American reptile breeding company and another major supplier to PetSmart and many other stores. Tens of thousands of frogs, lizards, turtles, snakes, bearded dragons, and other reptiles were confined to barren, filthy, crowded plastic tubs and deprived of even the most basic care, such as fresh food and water, heat and UV lamps, and veterinary attention, according to PETA’s investigation, which also found out that hundreds of those animals were dead or had been killed. Please comment on Facebook and Twitter pages of REPTILES BY MACK and tell PetSmart officials that YOU WILL NEVER BUY ANYTHING FROM THEIR STORES AS LONG AS THEY CONTINUE TO SELL ANIMALS. Kind consumers can easily find companion-animal supplies at businesses that don’t sell animals, including TARGET, WALGREENS, and online retailers. “The hardest the battle, the sweetest the victory! We are overjoyed to announce the end of Gadhimai Slaughter as the temple trust agrees to cancel all future animal sacrifice and urges devotees not to bring animals to the festival. Tune into Nepal FM 91.8 MHz tomorrow 7-7:30 am where President of the Temple Trust, Ramchandra Shah goes on-air with an official announcement on the end of world’s biggest mass sacrifice! And everyone else who did their bit to try and bring this festival to a close by signing petitions, sending messages, writing letters and even going to Nepal to protest. It is not often that we get positive news and we can get so despairing that anything any of us do actually makes a difference. So this is just so refreshing and positive. “I realised that animals are so much like us — they have the same organs as us… and feel the same pain we do,” Prasad told AFP. 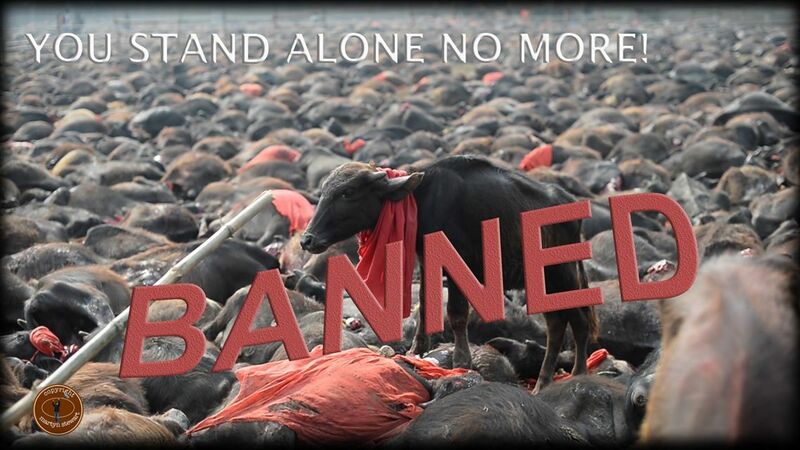 Manoj Gautam, founding member of AWNN and campaigner against the Gadhimai festival, said: “We applaud the temple committee’s decision to end this mass slaughter of innocent animals and hope that they will continue to support us in our future endeavors for protecting animals in the country. Please urge the ACSO to seize all animals from Willards Rodent Factory without further delay. Please help bring an end to the cruel and neglectful treatment of animals at Willards Rodent Factory by signing a petition to Adams County, Colorado, Sheriff’s Office (ACSO) urging them to seize all animals from Willards Rodent Factory without further delay. Action can be taken by anyone worldwide. Please don’t be put off by the fact many of the animals are rodents. Rodents are sentient beings, mammals like you and I and deserve to be treated with compassion and consideration. Their lives are as important to them as ours are to us. You can read more about sentience and intelligence in Rodents further down. Please continue reading for more details and a link to information about sentience in Rodents, but if you do not have time please at least sign the petition. This is a quick sign petition that needs only a few details. Warning! You will need to scroll down to sign. There are some distressing graphics which many of you may find disturbing. If you scroll down quickly you will avoid seeing them. I have to say it can put many people off signing petitions if they are presented without warning to disturbing images. I know of one person who cannot click on such links. I try to warn people as much as possible and not simply present horrifying images. It is not easy to know where to draw the line, while shocking people into action may be effective in some instances it can have the opposite effect when people hesitate to click on a link. Eyewitness footage and photos expose extreme suffering of rats, mice, reptiles, hedgehogs, and other animals at Colorado animal dealers’ warehouse and pet store. The Kubics breed rats and mice in a barn located on their Adams County property—just a few feet away from their family residence. Thousands of rodents—crowded shoulder to shoulder in filthy tubs on top of bedding saturated with weeks’ worth of waste—were kept in bins and metal troughs inside the barn during the course of PETA’s investigation. The Kubics did not employ a single full-time person to care for the animals. Lynn Kubic claimed that “you just don’t make enough money at this to … have a ton of employees or spend a ton of time out here.” Hundreds of rodents were found dying, dead, and decomposing. Tubs housing rodents frequently flooded, drowning rats and mice by the hundreds. Lynn Kubic—who admitted that she would not enter the barn after a flood because of the stench—lamented the loss of money but never the suffering of the drowned animals. Cats were permitted to roam freely in and out of the “rodent factory,” terrifying rats and mice by opening tubs in which rodents were housed, defecating above them, and even tearing them apart. Rats and mice starved to death. Lynn Kubic admitted, “I probably lose more animals to starvation … than floods.”The Kubics fed rats and mice once per month, allowing the food to become moldy and covered with feces as the weeks passed. Warning extremely shocking particularly in the beginning I couldn’t watch. You can just listen and not watch for details but that is distressing enough. Despite having extensive evidence of persistent, widespread cruelty to animals for more than two months, the Adams County, Colorado, Sheriff’s Office (ACSO) has not helped the thousands of animals at Willards Rodent Factory, which is owned by Lynn and Kenneth Kubic. The Kubics and their workers admitted to “whacking” rats and mice—swinging them by the tail and hitting them against surfaces in an effort to kill them. Hundreds of rats and mice drowned at Willards Rodent Factory when the tubs housing them flooded, while others—most frequently those who were ill or injured—were thrown outside to be torn apart by cats. The Kubics failed to provide effective veterinary care or euthanasia to scores of ill and/or injured animals—including a rat whose face was apparently chewed off, a hedgehog whose infected eye was neglected for so long that it shrank and lost all vision, and reptiles with mucus oozing from their mouths. Thousands of fish and hundreds of other animals perished—with many left to rot alongside live animals—and ailing survivors were routinely thrown into the freezer to die. Please take a moment today to urge the ACSO to end animal suffering at the Kubics’ hands by seizing all animals from Willards Rodent Factory without further delay. The filthy, stressful conditions uncovered at these facilities are typical of what PETA’s investigations of the pet trade have documented again and again. The most important thing that you can do to help end this cruelty is to refuse to shop at stores that sell live animals. American Fashion company BCBG MAX AZRIA refuses to stop selling angora and fur despite knowing that many animals used in these vile industries are stripped of their fur and skins while they are still fully conscious. 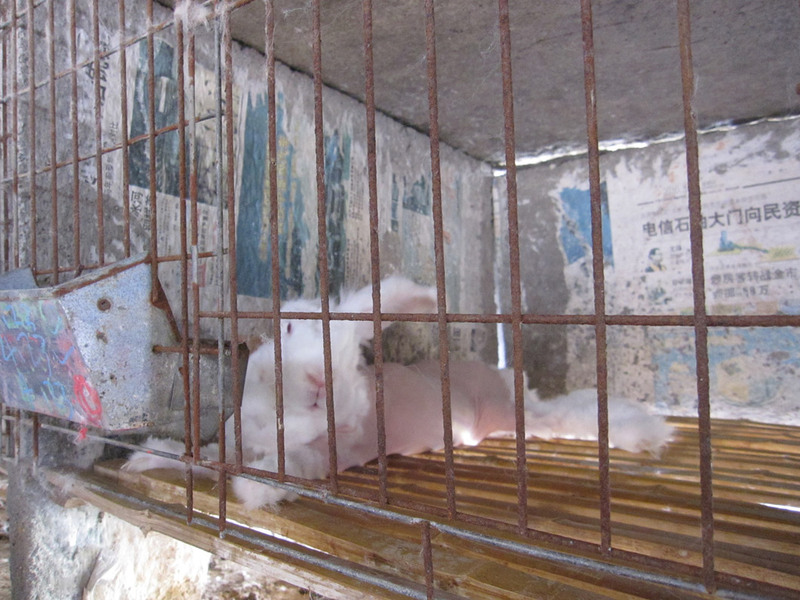 Shocking undercover footage of China’s angora wool industry—where about 90 percent of the world’s angora comes from—shows workers tying rabbits down and violently ripping their fur out by the fistful. BCBG also sells fur from Asiatic raccoons ( also known as raccoon dogs ) – animals who are often slammed to the ground and beaten on fur farms.Video footage shows one skinned animal who is still alive and who musters the strength to lift her bloody face up to look at the camera. These animals, along with foxes and other fur-bearing animals, suffer and die so that BCBG can turn their fur into vests, collars, and scarves. BCBG Max Azria’s 2014 Holiday Collection! Official BCBG MAX AZRIA website. http://www.bcbg.com/ – Please consider telephoning or e-mailing BCBG MAX AZRIA and ask them to stop stop selling angora and fur. phone at 877.707.2224 or by email at guestservices@us.bcbg.com. Official BCBG MAX AZRIA page on Twitter. Official BCBG MAX AZRIA page on Facebook.